In 1834, farm workers in west Dorset formed a trade union. Unions were lawful and growing fast but six leaders of the union were arrested and sentenced to seven years’ transportation for taking an oath of secrecy. A massive protest swept across the country. Thousands of people marched through London and many more organised petitions and protest meetings to demand their freedom. 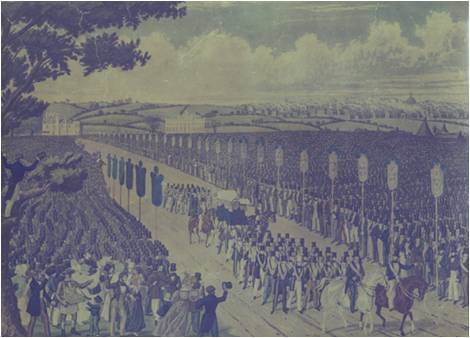 The protest campaign proved successful and the Tolpuddle Martyrs returned home in triumph. The Tolpuddle story is about how ordinary working people combined together to defend their families. The idea of solidarity as a basic human right is now an international demand. 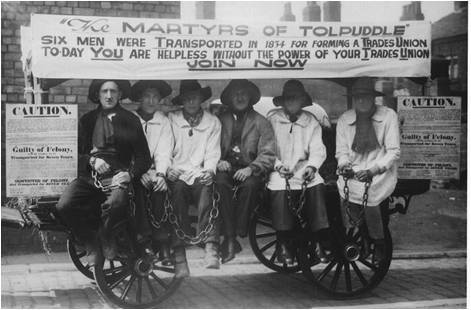 The story of the Tolpuddle Martyrs is celebrated in the small museum in Tolpuddle and at the Festival on the weekend of the third Sunday in July. The above has been taken from the Tolpuddle Martyrs site. Want to know more? Click here to visit the site.